Provides the merchandising of product on one side of the store fixture. 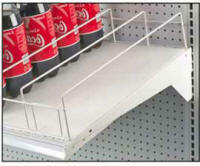 Fences and dividers divide shelves into sections or bins. A versital gondola and counter system available in many sizes and configuratons. Available in a 24" and 48" wide shelf X 13" Deep. ESSI is a provider of Madix Pallet Racking available with many accessories and in many sizes. Considered more of an island unit, merchandise can be displayed on both sides ot the shelving unit. Available for single sided wall sections. Gravity feed soda bottle displays gor Gondola Shelving. Many colors and patersn available. 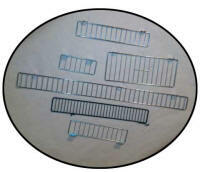 We have slatwall shelves, hooks, hangers, and many accessories for Slatwall.